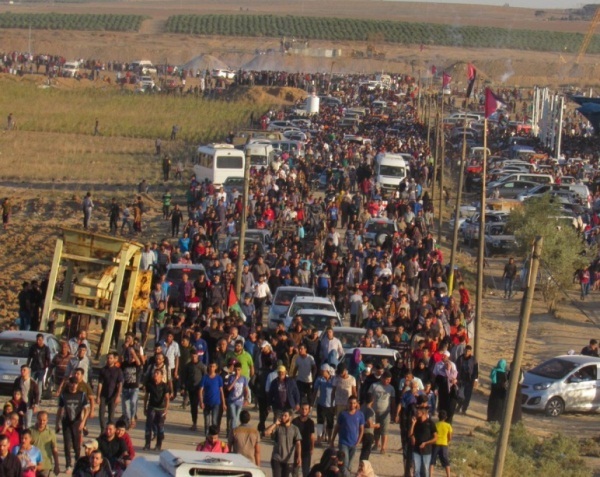 On Friday, November 2, 2018, another “return march” was held along the Gaza Strip border. The march was relatively small. Most of the Palestinians did not approach the security fence. 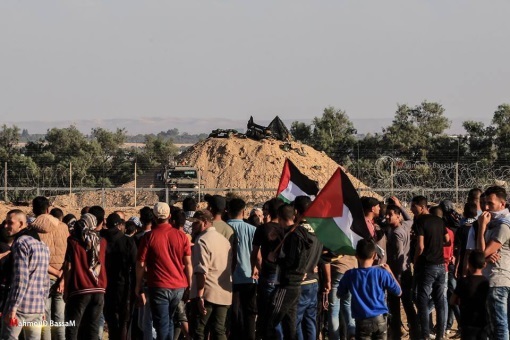 As a result, the level of friction with IDF forces was relatively low and therefore the number of casualties was low (according to data from the ministry of health in the Gaza Strip, 32 demonstrators were evacuated to hospitals). 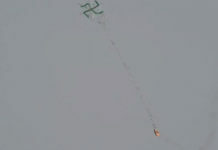 In addition, no incendiary kites and balloons were launched and no attempts were made to break through the fence. The substantial decrease in the level of violence was apparently the result of Egyptian pressure on Hamas and the other terrorist organizations after progress had been made in the negotiations for an arrangement. An Egyptian delegation visited one of the riot focal points for a first-hand look at the Palestinians’ implementation of the understandings. Members of the Supreme National Authority of the Great Return March held a press conference after meeting with the Egyptian security delegation and called for peaceful “return marches” (al-Watania, November 1, 2018). 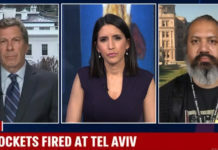 However, senior figures of Hamas and the other terrorist organizations made it clear they would not stop holding However, senior figures of Hamas and the other terrorist organizations made it clear they would not stop holding the marches. Apparently for the first time since August 2018, significant progress was again made in contacts for an Egyptian-mediated arrangement. It also appears a minimalist arrangement was discussed, which will lead to a lessening of violence on the ground in return for opening the crossings and the entrance of humanitarian aid into the Gaza Strip (based on arrangements reached at the end of Operation Protective Edge). However, there are still obstacles from external factors (such as the Palestinian Authority), and from the Palestinian terrorist organizations (the Palestinian Islamic Jihad (PIJ) is liable to cause problems because of a desire to put its stamp on any agreement reached). Right: Palestinians demonstrate in eastern Gaza City (Palinfo Twitter account, November 3, 2018). Left: Palestinians demonstrate in front of IDF forces in the central Gaza Strip during the “return march” (Palinfo Twitter account, November 2, 2018). The 32nd “return march” (since March 30, 2018) was held on November 2, 2018. Its slogan was “Our people will defeat the wretched decision” (i.e., the Balfour declaration, whose 101st anniversary was marked on November 2, 2018). Participation in the march was limited compared with previous weeks. Ceremonies were held in the “return camps” where copies of the Balfour Declaration and pictures of Lord Balfour were burned. (Supreme National Authority of the Great Return March Facebook page, November 2, 2018). 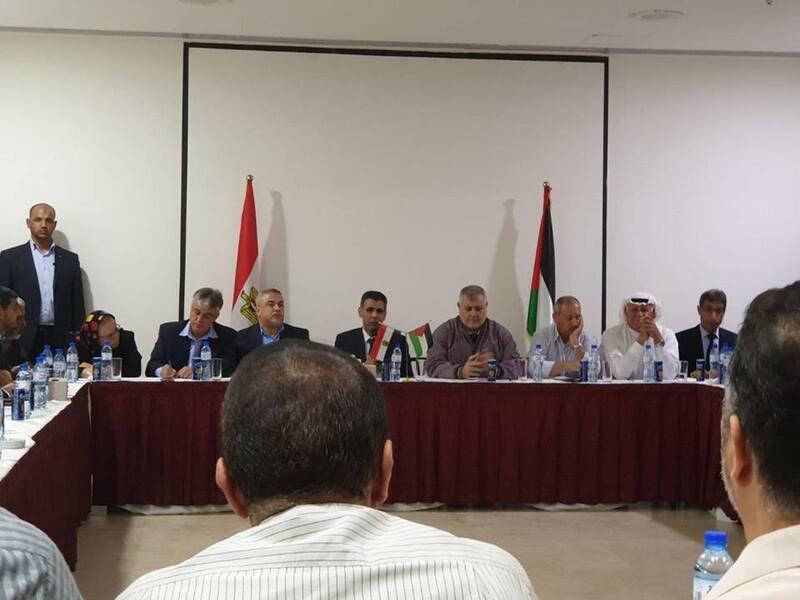 Before the demonstration, members of the Supreme National Authority of the Great Return March and Lifting the Siege held a press conference where they called on the Gazans to come en masse to the marches on Friday and to hold them peacefully, without giving the Israeli snipers an opportunity to shoot at them. The Authority also thanked the Egyptian delegation for its role and the efforts it has made for the sake of the Palestinian people (al-Watania, November 1, 2018). Most of the demonstrators gathered at five “return camps” and did not approach the security fence. 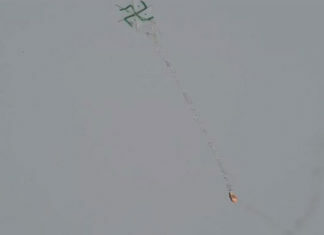 During the events on Friday no attempts were made to break through the fence and no incendiary kites and balloons were launched into Israeli territory. According to reports, Hamas’ restraint force kept demonstrators away from the fence (Fatah Facebook page, November 2, 2018). At a site east of Gaza City several demonstrators tried to remove an obstacle that had been placed about 100 meters (about 6/10 of a mile) from the fence. The Palestinian media reported that several demonstrators had attempted to cut through the fence (Shabakat Quds Twitter account, November 2, 2018). 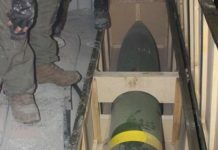 They also reported that Israeli artillery forces had fired a shell at a target near a military infirmary east of Gaza City (Shabakat Quds Twitter account, November 2, 2018). The low level of violence led to a relatively small number of casualties. Ashraf al-Qidra, spokesman for the ministry of health in the Gaza Strip, reported 32 Gazans were wounded and evacuated to hospitals (Ashraf al-Qidra’s Twitter account, November 2, 2018). The Egyptian security delegation, working to achieve an arrangement, visited, for the first time, one of the focal points of the demonstrations, the “return camp” east of the Jabalia refugee camp in the northern Gaza Strip (Shabakat Quds, November 2, 2018). Apparently they wanted a first-hand look at the situation on the ground after understandings had been reached for stopping the violence. The Egyptian security delegation visits the “return camp” in eastern Jabalia (al-Watania, November 2, 2018). Khalil al-Haya, a member of Hamas’ political bureau, gave a speech in eastern Gaza City where he said the “return marches” would continue. He also sent a veiled warning to Israel, saying “You will see in the winter what you didn’t see in the summer” (al-Aqsa TV, November 2, 2018). Senior PIJ figure Khaled al-Batash said the “return marches” would continue and would be louder and more meaningful (al-Aqsa TV, November 2, 2018). Senior Hamas figure Isma’il Radwan said it was the National Authority that decided every Friday if cars would be designated to bring tires, etc. He called on the Arab-Islamic nation to pay attention to Israel’s weaknesses. As “proof” he claimed that according to the media, many Israeli families from the communities near the Gaza Strip had fled from their homes because they felt unprotected (al-Aqsa TV, November 2, 2018). Maher Muzhir, a member of the political bureau of the Popular Front for the Liberation of Palestine (PFLP), said every avenue had to be explored to lower the number of losses and defend the blood of the Palestinian people. 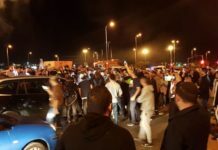 He claimed the National Authority would determine the degree of escalation at the marches, adding that the activities of the “night harassment group” would not stop (the launching of incendiary kites and balloons, cutting through the fence and burning tires) (Dunia al-Watan, November 2, 2018). PIJ spokesman Da’ud Shehab said the new tactics could make it possible to keep march participants from being wounded. However, he emphasized that did not mean the marches would stop. He said they were discussing giving a number of instructions to the participants on the ground so there would be no more loss of life. He expressed his esteem for the Egyptian security delegation, which was working to achieve a reconciliation and end the “aggression” against the Gaza Strip (alresala.net, November 1, 2018). The lowered level of violence of the October 2 “return march” was apparently the result of a number of understandings achieved through Egyptian mediation. As part of the attempts to reach an arrangement, an Egyptian delegation headed by Ahmed Abdel Khaliq, head of the Israeli and Palestinian directorate in Egyptian General Intelligence, came to the Gaza Strip. 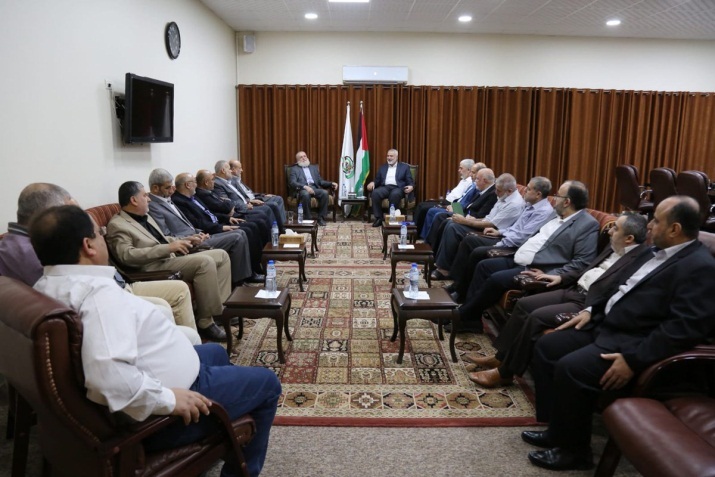 The delegation held a series of meeting with representatives of Hamas, the other Palestinian organizations, and members of the Supreme National Authority of the Great Return March. Left: The leadership of Hamas and the PIJ meet to discuss the Egyptian initiative (Palinfo Twitter account, November 1, 2018). 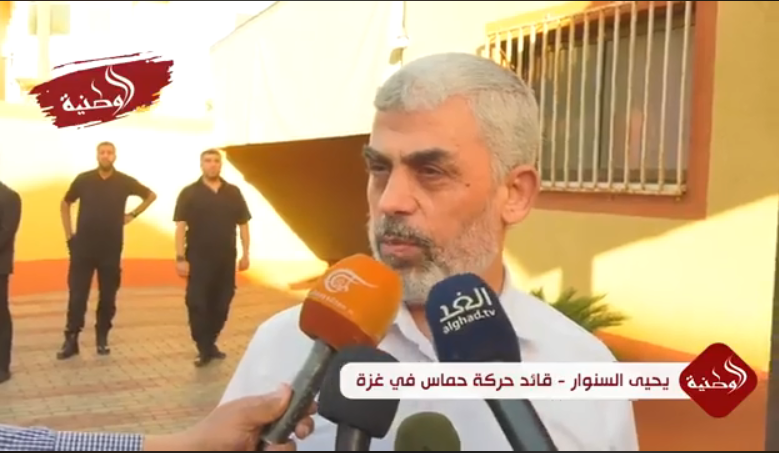 Right: Yahya al-Sinwar interviewed after the joint Hamas-PIJ meeting (al-Watania TV, November 1, 2018). “Hamas sources” reported that the meeting held in the office of Isma’il Haniyeh, head of Hamas’ political bureau, was positive and dealt with a mechanism for transferring the funds from Qatar to the Gaza Strip. To overcome Israel’s objection to the money’s reaching Hamas, the Egyptian delegation suggested that the UN supervise the mechanism that would be forged for disbursing the funds to Hamas officials (al-Akhbar, October 31, 2018). “Palestinian sources” explained that in fact no lull agreement had been reached, but an equation of “quiet in return for quiet” had been formulated, based on the ceasefire of 2014. The sources added that it had been agreed that quiet would be restored to both sides of the border; the crossings would be fully opened, including the Rafah Crossing; and merchandise would be delivered to the Gaza Strip under Israeli inspection. The agreement also included the delivery of fuel for the Gaza Strip power plant, a resolution of the crisis with the Palestinian Authority (PA) regarding the paying of a tax on fuel and extending the fishing area to 12 miles within half a year to a year. The sources also noted that according to the arrangement Qatar said it would be committed to pay salaries to Hamas officials for two or three months; and that Israel and the UN, and possibly also the PA, would supervise the transfers (al-Quds, November 2, 2018). 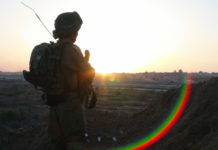 “Sources in the Gaza Strip” reported that at the meetings between the Palestinian organizations and the Egyptian delegation they had reached a decision to stop launching incendiary balloons, cutting the security fence and the activities of the “night harassment group.” However, it was decided the marches and the “return camps” would continue, without creating clashes with the IDF. 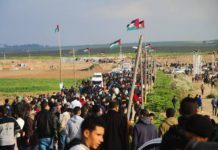 In addition, they would stop the daily demonstrations in the northern Gaza Strip and continue the “return marches” in their new format until the end of 2018. In the meantime, Egypt would work to extend the fishing area to 14 miles, leave the Rafah Crossing permanently open and support infrastructure projects and projects that were expected to provide about 30,000 jobs in the Gaza Strip. Egypt would also work to promote prisoner exchange deals and institute a ceasefire of at least three years with international supervision and Russian and UN sponsorship (al-Akhbar, November 2, 2018).